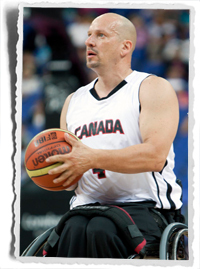 (LONDON) The Canadian Men’s Wheelchair Basketball Team cruised past Colombia 68-42 Monday and will head into the quarterfinals of the London 2012 Paralympic Games with a perfect 5-0 record. They finish in first place in their pool and now wait for their opponent in the next round to be decided later today. It will be one of Spain, Turkey, or the United States. Patrick Anderson, of Fergus, Ontario, played in just the opening quarter against Colombia and added 13 points to his tournament-leading 133 points. He is averaging 26.6 points per game. Dave Durepos, of Fredericton, New Brunswick, was the game’s top scorer with 18 points. Joey Johnson, of Winnipeg, MB, had a team-high six rebounds, while Bo Hedges, of Wonowon, BC, added 10 points and six assists. “It felt good out there, and my teammates found me. That’s what happens in a good team – they look for the open man and they found me today,” said Durepos. “That’s where we want to be. We want to be number one in our pool. The next games are going to be tough ones and we have to take control of what we do,” he added. Durepos demonstrated why he is known as one of the best outside shooters in the game by air mailing four 3-pointers. He finished 4-for-5 from beyond the arc (80%). The Canadian Men get a rest day on Tuesday before quarterfinals start on Wednesday at the North Greenwich Arena. Katie Harnock, of Elmira, Ontario, took her game to another level on Monday, leading Canada to a 67-50 victory over Great Britain. With the win, Canada will move on to the quarterfinals with a 3-1 record to face China, Mexico, or the USA. Harnock’s shooting was superb as she went 10-for-17 from the paint (59%), en route to a game-high and personal best 20 points and six rebounds. She was a leader on a Canadian team that played with confidence and had several players producing marquee games. 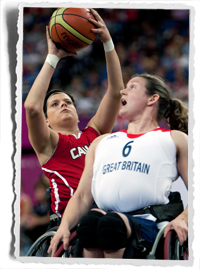 Cindy Ouellet, of Quebec, QC, tallied 18 points, eight rebounds, and eight assists in her best-ever Paralympic performance. Janet McLachlan, of Vancouver, BC, dominated the boards with a game-high 15 rebounds. Holland Landing, Ontario’s Tracey Ferguson also accumulated eight assists. Both her and Jamey Jewells, of Donkin, Nova Scotia contributed four points. “I think it shows our depth and our strength that when we do get everyone involved and we do stick to our plan we are a very successful team. We have a lot of people that can pour in points and today was another good example of that,” said Harnock. Once again Canada’s sound defence was an asset. They limited Great Britain shooters to a meagre 38% from the field. Canada went on an eight-point scoring run to end the first half leading 34-25, and never looked back. “We forced the British team to do things we wanted them to do. We contained them, they had a nice run in the first quarter, then we made some adjustments and contained them well,” said team Canada Head Coach Bill Johnson.